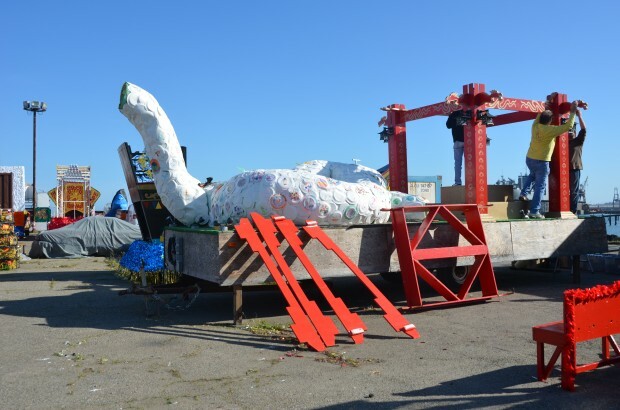 Guest Blogger: Thank You from Gary Meeker to All Involved in the CNY Float Build! Greetings float builders and supporters! A week after the parade, I've finally returned to a normal life. Having spent every weekend since December building the float, I'm definitely enjoying having that time back! In my 6 years of involvement in CNY Parade float activities, I have learned that the only way we make the magic happen is through a team effort by dedicated parents, families, and supporters from the ISTP community. First and foremost, I wanted to send my sincere thank you to all who volunteered in any capacity to make the float happen, whether you helped with build, setup, design, or teardown. It simply could not have happened without all of you! Although in this blog, I focus just on those specifically involved in the float build itself, the entire parade effort spans many more people, and I am grateful for efforts put in by everyone involved! Float build this year will forever stick in my mind, and not just because of the time invested or the "nail-biter" finish, with construction still happening in the staging area on Main St. in San Francisco. This float build will stay with me because of the core team of people who formed the vision and brought the float to life. In 4 of the 5 past years, we've always had one individual who set the direction and did much of the work. Someone who through sheer force of will and strength of creative vision lead us to the final result. This year was different, with a group of people who each contributed a critical part of the vision. Without any one of them, the float simply would not have been what it was. Jim often joked that if we did not have the amazing team we had, the snake would have simply been last year's dragon with the legs removed and a fresh coat of paint! In a somewhat sequential order, I'd like to briefly mention some of the key contributions that lead to this year's success. First, there is alumnus and trained architect Stephen Sun, who joined the team from the beginning and stayed to the end, bringing the creative energy and vision that set the effort in motion. Steve came up with the original proposal for the enormous snake surrounding a spinning globe that ultimately became the float. From his initial sketch, he took it 10 steps further, creating a full scale CAD model for the float. His digital model was so accurate that he was able to use the software to create individual sections that we could cut out and build. As we made progress using flat pieces of wood, bamboo and rattan, our snake came to life, and any skepticism evaporated. This was going to work!! Thanks to Steve! Next, there is Todd Carper. After helping with the dragon last year, Todd solved our most immediate and perhaps most important issue. Where were we going to build this thing? He offered up his shop in Burlingame and opened it up to everyone nearly every weekend since December. But this was not just an empty garage. Todd had every imaginable tool, tons of space, and even heat! Those who have worked on the float in the past will realize how great this is. But that isn't all Todd brought to the team. Todd not only had the tools, but he also had solutions to many of the issues we faced (and there were many! ), as well as a lot of great ideas. Todd himself was as valuable (if not more) than the workspace he provided! Karl Kneip is a regular on the float build team. Woodworking is his favorite part and he was quick to come up with the first prototype of the globe before any work had been done on the rest of the float. His basic design was used for part of the final globe. As in past years, Karl joined in for many of the build sessions, and I have no doubt that he's already thinking about next year's horse! Phil Brooks, husband of ISTP's own Susan Brooks, joined us again this year and took on some of the most challenging tasks. After his amazing spine of the dragon last year (which alone could support the 12 kids), Phil took on the challenge of creating the spinning globe. Given the challenging design constraints - spinning, yet lit from inside, Phil came up with a novel design in which the weight of the globe rested at the top of a mast around which it could spin. While his design was hidden under the wraps, it was quite amazing! Despite countless hours invested in this and other work for the float, time worked against us - but we'll see the globe spin next year for sure. Dave Del Grande (and behind the scenes Lori Svikel) came to the rescue (as they had in past years) to ensure that the aesthetics of the float were just right. Whenever something didn't seem right, Dave would get "the look" and set about to fix it. Dave and Lori created the amazing firecrackers as well as the incredible snake head which Dave constructed from over 600 plates and half the hot glue in Northern California! If we ever want somethong to look amazing, we can count on Dave to make it happen! Dave was the "last man working," 8ft up a ladder, still gluing plates just before we rolled onto Market street. Gary Holmes joined us midway through and worked on many aspects of the build. His unique contribution was in the decoration of the globe, especially the translucent vinyl ISTP lettering around the globe's equator, through which the light glowed, and the blue bouncing "ISTP guy" prominently traveling on top of the globe. He had more to add, but again time worked against us. Still, the globe looked marvelous! Finally, there is Andy Farlie. After getting the "float bug" last year, Andy was back with his big green truck and precision driving skills. We often joke that Andy can do the work of two men, but his real talent is in thinking things through and finding a simple solution. Even after seeing him in action last year, I'm still amazed at his skills in manipulating the trailer. His perfect backing into a ridiculously tight spot in the dark and crowded pier after the parade still leaves me in disbelief. He remains the keeper of the float bed, certain to be back next year! Thanks also go to Lorin Sharp, who joined us on many build sessions, to Chris Pickett for help with some of the initial snake construction, and to veteran float volunteers Tamer Kira (assembly day), Hon Wah Chin, Ken Leung and Julia Wei (tear-down day). Also, special thanks to the families of all of the volunteers for giving their time and for occasionally bringing kids to the build sessions to join in the fun! Finally, I'll wrap up by thanking Jim Armstrong, who jumped into the unknown in taking on the role of Parade Chair. He took care of the coordination of all other aspects of the parade, about which I still know nothing. I still don't know what happens in the Chinese Chamber of Commerce, and probably don't want to know, but Jim took care of it! Jim even contributed to the float with his last minute suggestion to add the legs to the dragon head on the front of the truck. It completed the look!